The account was for nine years ending Mich. 1723; and the petitioner prayed a warrant to the Auditor for allowing the usual fees. This, as shown by the Auditor's Report, would reduce the balance from 353l. 7s. 3½d. to 113l. 7s. 3½d., which sum he had paid into the Exchequer. 4 Sept. 1727. 3 pages. 2. Petition of John Plunkett and George Kelly, prisoners in the Tower of London, to the Lords of the Treasury for a renewal of the warrant for their subsistence, the allowance granted by his late Majesty not having been paid since his Majesty's demise. “5 7ber 1727. Mr Cracherode to endorse ye allowances by wh authority granted & to wt time paid. “Septr 12th 1727. I have pd the petrs 5s a day to the 10th of June last inclusive by warrt of Trea[su]ry; wch if my Lords think fit to renew I beg an imprest of 500li having hitherto carryed on his Maty's affairs out of my own money. A. Cracherode.”—“26 7ber 1727. To be layd before the King.”—“30 Novr 1727. Mr Cracherode is to continue to pay the allownces formerly settled for the subsistence of Mr Plunket and Kelley the two prisoners in the Tower.” 1 page (4to). 3. Report of Thomas Jett, Auditor, to the Lords of the Treasury, upon the accounts of Samuel Burton, deceased, late receiver of the rents of the Savoy Hospital. His final account, ending Mich. 1723, was examined and stated in order to be engrossed for declaration. Has frequently written to Henry Howarth, Esq., the present Receiver of the Savoy rents, to make speedy payment into the receipt of the Exchequer, but as his accounts have not been laid before him (the Auditor), cannot say what the balance is, but believes it may be about 500l. His late Majesty demised to the chapel wardens of the Savoy, the profits of breaking up the ground in the chapel and chapel yard, and the tolling of the bell for 21 years, with a clause of reassumption. The chapel wardens have in their hands about 51l. of the profits of the ground and bell, before the patent, which they absolutely refuse to pay. If they are threatened with the reassumption it may be a means of getting in the money, “no distress being to be had” 7 Sept. 1727. Minuted:—“L~res sent to Poworth, Chapell Warden.” In the Minute Book, vol. 26, p. 28n, 13 Sept. 1727, is:—“Mr Auditor Jett's report of the 7th Septr, about the rents of the Savoy Hospital, is read and my Lords order a letter to be writ to the Chapell Wardens of the Savoy to pay 51li in their hands belonging to the Crown of profitts arising by the ground and bell before the comencement of their lease thereof into the Exchequer or Receiver of those Rents forthwith.” 2 pages. 4. Petition of James Clarke, Esq., to the King. 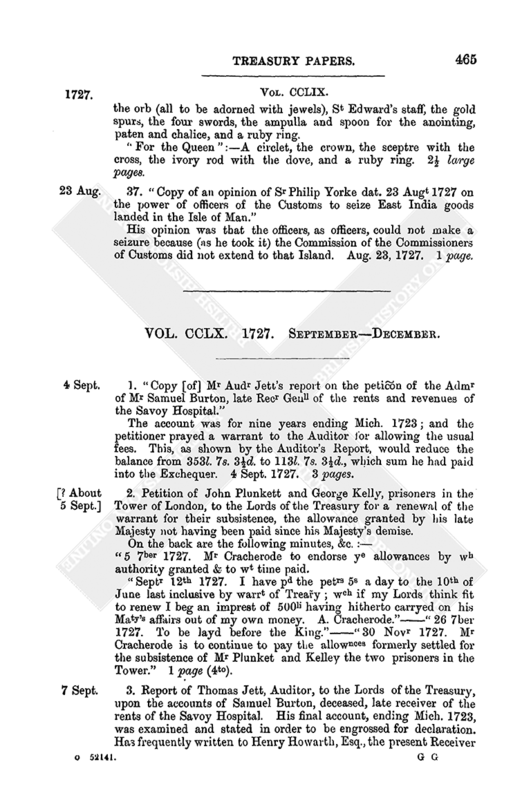 In the late Queen's reign, when the liberties and privileges of the city of Dublin were struck at, and many violent attempts made by the then Government of Ireland to subvert the ancient constitution of that city, in favour of the Pretender, John Forster, Esq., then Recorder (since Lord Chief Justice of the Common Pleas) sent for petitioner, who was at that time in considerable business in the King's Bench in that kingdom, and asked him if he would venture to be concerned as agent or manager for the then lord mayor, aldermen, sheriffs, and citizens in all the prosecutions then carried on and unjustly supported against them in the said Court; which petitioner most readily agreed to, and acted therein with integrity and resolution, and constantly and diligently attended to the same, though he well knew he should thereby incur the displeasure of the judges, and hazard the loss of his business, which happened accordingly. 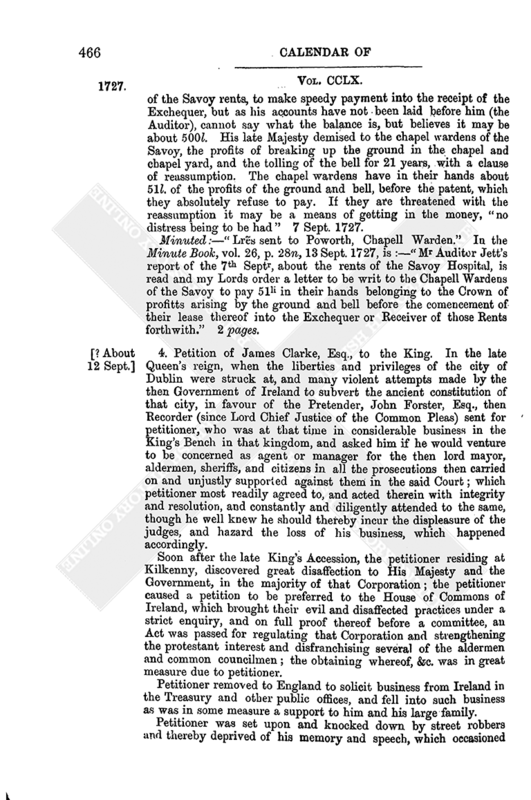 Soon after the late King's Accession, the petitioner residing at Kilkenny, discovered great disaffection to His Majesty and the Government, in the majority of that Corporation; the petitioner caused a petition to be preferred to the House of Commons of Ireland, which brought their evil and disaffected practices under a strict enquiry, and on full proof thereof before a committee, an Act was passed for regulating that Corporation and strengthening the protestant interest and disfranchising several of the aldermen and common councilmen; the obtaining whereof, &c. was in great measure due to petitioner. Petitioner removed to England to solicit business from Ireland in the Treasury and other public offices, and fell into such business as was in some measure a support to him and his large family. Petitioner was set upon and knocked down by street robbers and thereby deprived of his memory and speech, which occasioned his loss of business. Prays to be placed on the establishment of Ireland for a pension. Also certificate in petitioner's favour with 61 signatures. 3 pages. 5. Petition of Martin Killigrew, Esq., to the Lords of the Treasury. Petitioner let for 21 years for the use of his Majesty, a parcel of ground called Castle Hill, in the co. of Cornwall, on which Pendennis fort is erected, at a rent of 200l., which has been paid pursuant to the King's warrant by the Paymaster General, who declines to continue the payment by virtue thereof: prays to have his Majesty's warrant for the rent. Undated. In the Minute Book, Vol. 26, p. 29b, 15 Sept. 1727, the petition is referred to as read “and ordered accordingly.” 1 page. (2.) To the same. It has been thought proper that Mr Russell (who was appointed Consul to Barbary) should go to Tetuan, altho' he has received no new instructions; because the Basha and people there must be kept in good humour if possible, their assistance for provisions and “fascines,” &c. being so necessary for this garrison, that they could be put to great difficulties if that should be refused; especially in case the siege should begin again. As it is likely that Mr Russell will be obliged to go to Maquiness, and he cannot go thither without more money than he had (viz. 100l. ), advised him to draw a bill upon the Treasury for 200l. more. Hopes the bill will be paid without deduction. The Morocco Ambassador chose at last to be sent to Tangier, which made it the more necessary for Mr Russell to go Tetuan; they being at present under different Bashas, and it is necessary to keep fair with both if possible, as well as with the King of Morocco. Torbay [? ship] at Gibraltar the 18th of Sepr 1727. (3.) To Mr Delafaye. Mr Russell has at last gone to Tetuan, as it was thought proper both by Lord Portmore and himself (the writer). It is to the same effect as the last. Asks Mr Delafaye to speak to the Duke of Newcastle about the bill. Dated as above. 4½ pages (4to). Again, p. 86n, 14 March 1727–8. 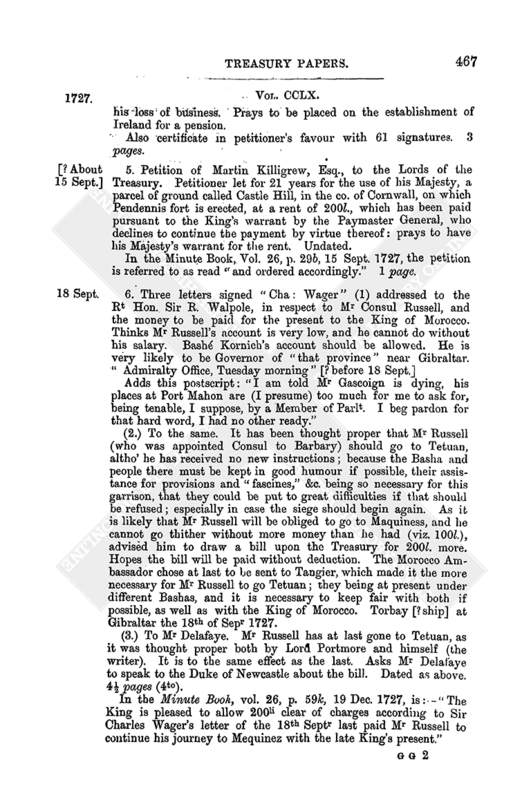 “Sir Charles Wager's letter of the 18th September last is read advising and desiring payment of Mr Russell's Bill of Exchange of 200li to Mr Thos Revell or order to enable him to go over to Tetuan, the assistance of the Basha of that place being necessary for provision, fascines, &c. for Gibraltar. My Lords order a warrant for the King's hand for paying of the said bill. Accordingly the fees and charges attending the recept thereof are to be included unless already paid upon a Minute of the 19 Decr 1727.” 4½ pages (4to). 7. “Arch. Hutcheson” to the Hon. William Clayton, Esq., one of the Lords of the Treasury. Spoke to Sir Robert Walpole of Mr Cunyngham's affair, and went afterwards to the Treasury and read what Mr Tilson had indorsed “on the bill brought from the Privy Seal.” Asks Mr Clayton to remind Sir Robert of it, that he may put it in his bag for the King's signing, and thereupon a new bill will be prepared by the Attorney General. Thought the Order in Council on the hearing between Mr Cunyngham and Mr Spooner, was somewhat hard on the former, who has surrendered his former patent on the faith that a new patent should be passed to him of all the lands in the former grant, excepting those in the possession of Mr Spooner, and the bill was accordingly drawn. Thinks the honour of the Administration is now concerned in the passing of a new grant; and there does not appear to be the least shadow of reason for delay. London, Septr 21, 1727. 1 page (4to). 8. 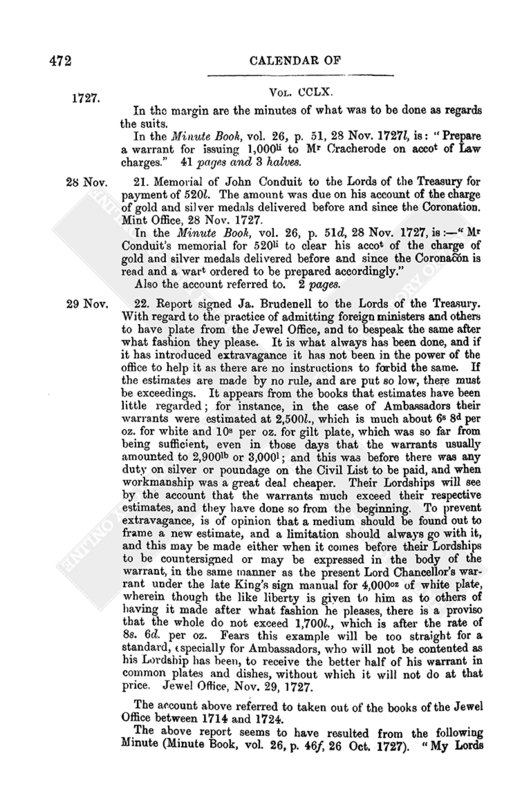 The Officers of Works to the Lords of the Treasury, sending an account of the debt owing at the time of the late King's death, to the officers, servants, and others, payable in the Office of Works. From April 1726 to 11 June 1727. Sept. 25, 1727. Accompanied by the account. 13 large pages. 9. Articles of agreement made between the Lords of the Treasury and Jonathan Forward, of London, merchant, viz., that in consideration of 5l. per head he the said Jonathan Forward will convey to plantations in America the persons in Newgate under sentence of transportation or in the county gaols of Hertford, Bucks, Essex, Kent, Sussex, and Surrey. Dated 26 Sept. 1727. 1 m. parchment. 10. State of what is due to the Countess of Portland for the expense of their Royal Highnesses officers and servants under her government from Mich. 1726 to Mich. 1727 when the new establishment commenced. Amongst the persons to whom payments were made was “To Mr. Handell 195[£]. 5 pages. 11. The pastors of the Evangelical Churches of the vallies of Piedmont to the King of Great Britain. The Protestant Churches in general, and those in particular which depend on his Majesty's rule, have true cause to bewail the loss of his late Majesty. The Evangelical Churches of the vallies of Piedmont, which have been subsisted by a miracle, have been, as much as any, sensible of the inexpressible loss, and now shed their tears on the Royal ashes. They would, like Rachel, refuse all consolation if Providence had not raised up his Majesty to succeed to the throne. Indorsed:—“The Minrs of ye Vaudois to his Maty, praying for a continuation of their pensions.” 2 pages. 12. 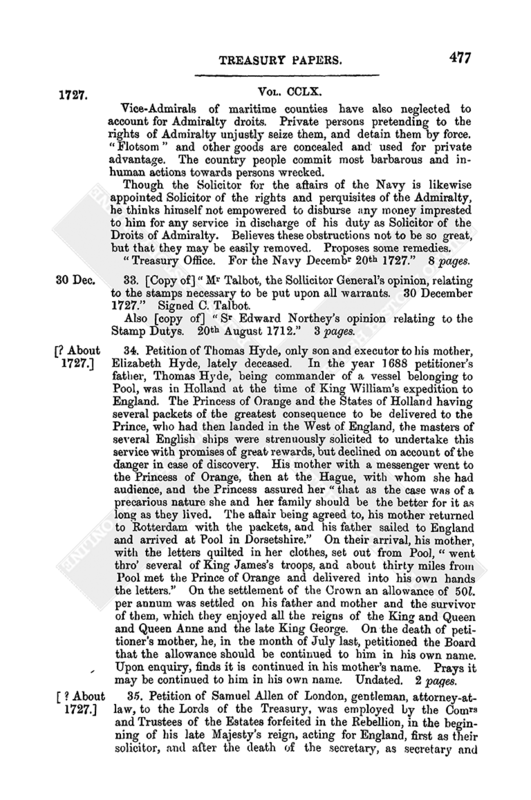 Order of Council on a report from the Comrs for executing the office of Lord High Admiral, respecting the case of Dame Margaret Walker, widow of Sir Hovenden Walker, formerly Rear Admiral of the White Squadron of the Fleet, who was in such bad circumstances, that she was unable to support herself and daughters, with the common necessaries of life. 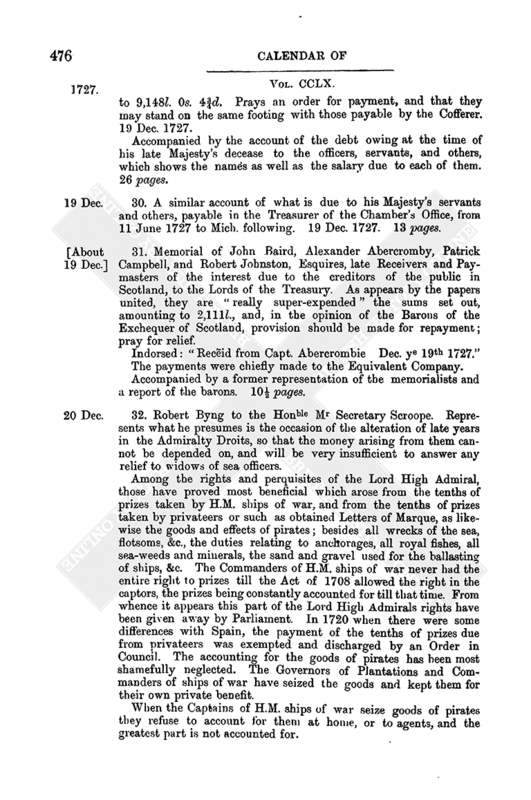 His Majesty in Council refers the report to the Lords of the Treasury to consider and report, if they have any objection to apply the money, arising from the rights and perquisites of the Admiralty, as proposed by the report of the Comrs to real objects of charity, not otherwise entitled to pensions or bounties. 2½ pages. 13. Lord Cobham to —. Received his correspondent's letter with the report of the Paymaster General of the Forces, on the representation of the States of Jersey, with a letter annexed to the report, from the Captains of the three Independent Companies of Invalids, garrisoned in Jersey. Is surprised to find so much stress laid on the letter, which is sent to him to answer. Would have hoped that such a letter could not have deserved so much countenance in opposition to the united request of the whole States of Jersey. The first reason advanced by the three Captains against the representation is that whatever English money comes to Jersey, goes to France, by reason of its trade and the advantage of the exchange. 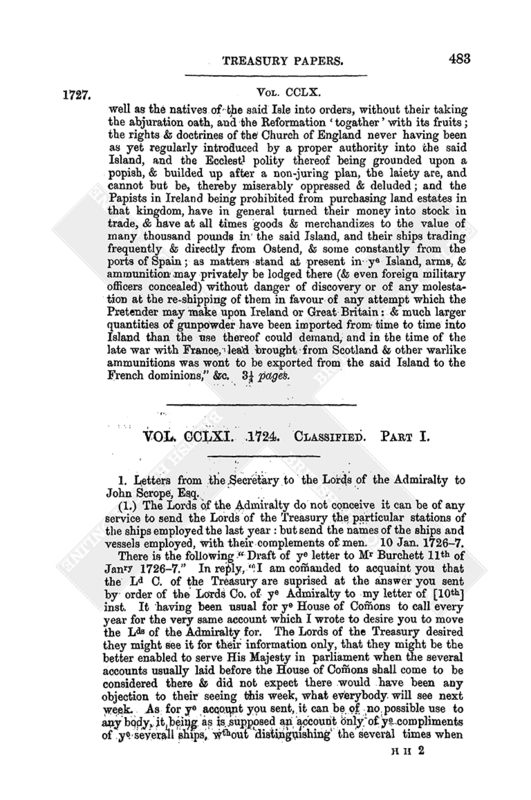 This, instead of being any objection against, is an unanswerable reason for complying with the request of the States; for it admits the very grievance complained of, and desired to be redressed; for it is undoubtedly true, whilst the French “liards” now current in Jersey bear their present exorbitant price, no English money, nor French neither, but liards, can be kept there, but will be all exported to France, and there laid out in liards to be imported into Jersey, by reason of the advantage of the exchange. The second reason is that if the money should be lost it would be difficult to subsist the men till the government can be made acquainted therewith. Replies that if the whole subsistence of the three companies be ordered to be paid in England, to a person he will nominate, he will engage that the same shall be duly paid to the soldiers in Jersey, free from charge to the government. The next reason is that French farthings are very convenient change for the soldiers. Replies, he cannot apprehend why English half-pence and farthings will not be as convenient change as French farthings, &c. The last reason assigned is that there is a greater demand for bills of exchange than all the officers, &c., can supply. Replies, the extravagant profits made by bills of exchange, from a want of specie in the Island, will furnish an answer to this objection, as well as discover the true occasion of the whole letter. 3½ pages. 14. Memorial of John Montgomerie, Esq., Governor of New York, to the Lords of the Treasury. It has always been the custom, upon his Majesty's appointing a Governor for New York, to send with him several utensils and commodities to be by him presented from his Majesty to the Kings or Chiefs of the Indian Nations in alliance with his Majesty's subjects. It is recommended that some addition be made upon this occasion to the presents usually allowed; to more firmly establish the friendship with the Indian nations already in alliance with these Colonies, and if possible to extend it to others. Also the list estimated to cost 1,300l. 17s. 6d. 30th December 1709.—Paid to Col. Hunter, Goverr of New York, for his Mat's present to the five Indian Nations, provided by him, 300li. 11th May 1716.—Paid to George Bampfield for his Mat's present to the five Indian Nations provided by him and consigned to the Governor of New York, 323l. 15s. 4d. The aforegoing paid out of the Civil List. 31st March 1721.—Paid to George Bampfeild for his Mat's present to the five Indian Nations, provided by him and consigned to the Governor of New York out of the 4½ p[er] cent., 882l. 2s. 10d. The present now desired amounts to the sum of 1,300l. 17s. 6d. In the Minute Book, vol. 26, p. 49, 31 Oct. 1727, is:—“Prepare a sign manual for issuing to Colo John Montgomerie, Governor of New York, 800li without accot to be laid out by him in suitable presents to be given to the Chiefs of the Indian Nations in alliance with the King, upon his first entring upon that Government.” 2 pages. 15. “An account of the charge of their Majestys' coronation in his Majesty's Jewel Office,” to which is added “An account of the expense of the late King's coronation.” Signed, “Ja. Brudenell,” Jewell Office, Oct. 31, 1727. Also three other papers connected with the expense of the same coronation. 4 pages and 2 halves. 16. Memorial of James Bogle to the Rt Hon. Sir Robert Walpole praying him to move his Majesty to grant him a commission as one of the Deputy Auditors of the Exchequer of Scotland in the room of Robert Arbuthnot, deceased. [Sir James Dalrymple claimed the right of naming a deputy in the room of Robert Arbuthnot, but this was disputed by memorialist.] Undated, but ? about Oct. as in the North Britain Book, vol. 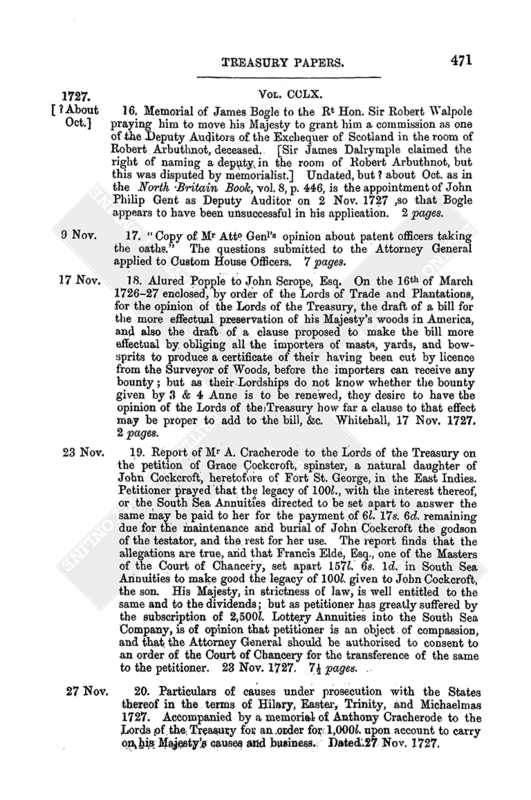 8, p. 446, is the appointment of John Philip Gent as Deputy Auditor on 2 Nov. 1727, so that Bogle appears to have been unsuccessful in his application. 2 pages. 17. “Copy of Mr Atto Genl's opinion about patent officers taking the oaths.” The questions submitted to the Attorney General applied to Custom House Officers. 7 pages. 18. Alured Popple to John Scrope, Esq. 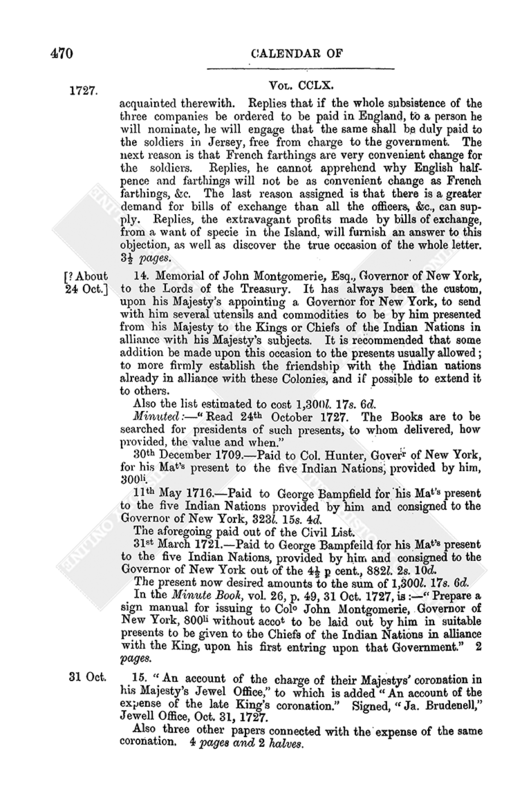 On the 16th of March 1726–27 enclosed, by order of the Lords of Trade and Plantations, for the opinion of the Lords of the Treasury, the draft of a bill for the more effectual preservation of his Majesty's woods in America, and also the draft of a clause proposed to make the bill more effectual by obliging all the importers of masts, yards, and bowsprits to produce a certificate of their having been cut by licence from the Surveyor of Woods, before the importers can receive any bounty; but as their Lordships do not know whether the bounty given by 3 & 4 Anne is to be renewed, they desire to have the opinion of the Lords of the Treasury how far a clause to that effect may be proper to add to the bill, &c. Whitehall, 17 Nov. 1727. 2 pages. 19. Report of Mr A. Cracherode to the Lords of the Treasury on the petition of Grace Cockcroft, spinster, a natural daughter of John Cockcroft, heretofore of Fort St. George, in the East Indies. Petitioner prayed that the legacy of 100l., with the interest thereof, or the South Sea Annuities directed to be set apart to answer the same may be paid to her for the payment of 6l. 17s. 6d. remaining due for the maintenance and burial of John Cockcroft the godson of the testator, and the rest for her use. The report finds that the allegations are true, and that Francis Elde, Esq., one of the Masters of the Court of Chancery, set apart 157l. 6s. 1d. in South Sea Annuities to make good the legacy of 100l. given to John Cockcroft, the son. His Majesty, in strictness of law, is well entitled to the same and to the dividends; but as petitioner has greatly suffered by the subscription of 2,500l. Lottery Annuities into the South Sea Company, is of opinion that petitioner is an object of compassion, and that the Attorney General should be authorised to consent to an order of the Court of Chancery for the transference of the same to the petitioner. 23 Nov. 1727. 7½ pages. 20. Particulars of causes under prosecution with the States thereof in the terms of Hilary, Easter, Trinity, and Michaelmas 1727. Accompanied by a memorial of Anthony Cracherode to the Lords of the Treasury for an order for 1,000l. upon account to carry on his Majesty's causes and business. Dated 27 Nov. 1727. In the margin are the minutes of what was to be done as regards the suits. In the Minute Book, vol. 26, p. 51, 28 Nov. 1727l, is: “Prepare a warrant for issuing 1,000li to Mr Cracherode on accot of Law charges.” 41 pages and 3 halves. 21. Memorial of John Conduit to the Lords of the Treasury for payment of 520l. The amount was due on his account of the charge of gold and silver medals delivered before and since the Coronation. Mint Office, 28 Nov. 1727. Also the account referred to. 2 pages. 22. Report signed Ja. Brudenell to the Lords of the Treasury. With regard to the practice of admitting foreign ministers and others to have plate from the Jewel Office, and to bespeak the same after what fashion they please. It is what always has been done, and if it has introduced extravagance it has not been in the power of the office to help it as there are no instructions to forbid the same. If the estimates are made by no rule, and are put so low, there must be exceedings. It appears from the books that estimates have been little regarded; for instance, in the case of Ambassadors their warrants were estimated at 2,500l., which is much about 6s 8d per oz. for white and 10s per oz. for gilt plate, which was so far from being sufficient, even in those days that the warrants usually amounted to 2,900lb or 3,000l; and this was before there was any duty on silver or poundage on the Civil List to be paid, and when workmanship was a great deal cheaper. Their Lordships will see by the account that the warrants much exceed their respective estimates, and they have done so from the beginning. To prevent extravagance, is of opinion that a medium should be found out to frame a new estimate, and a limitation should always go with it, and this may be made either when it comes before their Lordships to be countersigned or may be expressed in the body of the warrant, in the same manner as the present Lord Chancellor's warrant under the late King's sign manual for 4,000oz of white plate, wherein though the like liberty is given to him as to others of having it made after what fashion he pleases, there is a proviso that the whole do not exceed 1,700l., which is after the rate of 8s. 6d. per oz. Fears this example will be too straight for a standard, especially for Ambassadors, who will not be contented as his Lordship has been, to receive the better half of his warrant in common plates and dishes, without which it will not do at that price. Jewel Office, Nov. 29, 1727. The account above referred to taken out of the books of the Jewel Office between 1714 and 1724. The above report seems to have resulted from the following Minute (Minute Book, vol. 26, p. 46ƒ, 26 Oct. 1727). “My Lords observing that the practice of admitting Foreign Ministers and others, having plate from the Jewell Office, to order the fashion in which such plate shall be wrought, hath introduced great extravagancy and increase of expence to the Crown in that office; my Lords order a letter to be writ to the Master, to know the instrucc[i]ons (if any) which his office is under, and to certifye what the excess has amounted to, for all plate so fashioned during the late King's reign, and to report what methods may best be pursued for easing this and extravagancies of any other kind in the said Office for the future.” 3 pages. (2.) 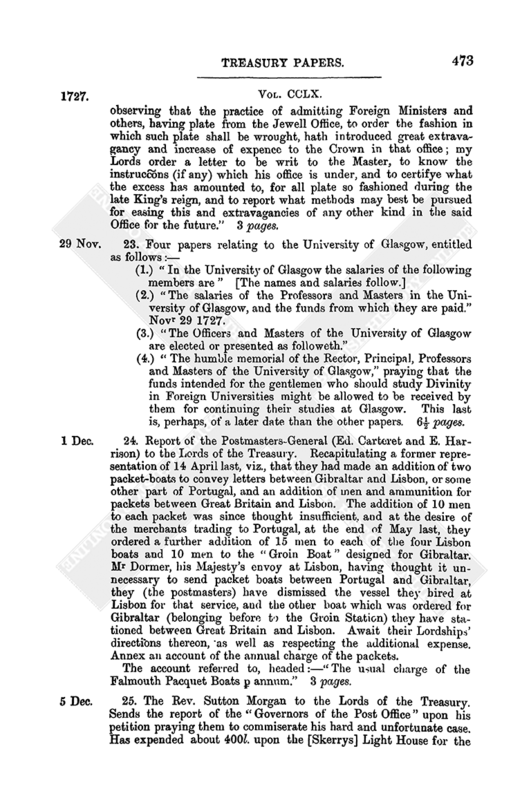 “The salaries of the Professors and Masters in the University of Glasgow, and the funds from which they are paid.” Novr 29 1727. (4.) “The humble memorial of the Rector, Principal, Professors and Masters of the University of Glasgow,” praying that the funds intended for the gentlemen who should study Divinity in Foreign Universities might be allowed to be received by them for continuing their studies at Glasgow. This last is, perhaps, of a later date than the other papers. 6½ pages. 24. Report of the Postmasters-General (Ed. Carteret and E. Harrison) to the Lords of the Treasury. Recapitulating a former representation of 14 April last, viz., that they had made an addition of two packet-boats to convey letters between Gibraltar and Lisbon, or some other part of Portugal, and an addition of men and ammunition for packets between Great Britain and Lisbon. The addition of 10 men to each packet was since thought insufficient, and at the desire of the merchants trading to Portugal, at the end of May last, they ordered a further addition of 15 men to each of the four Lisbon boats and 10 men to the “Groin Boat” designed for Gibraltar. Mr Dormer, his Majesty's envoy at Lisbon, having thought it unnecessary to send packet boats between Portugal and Gibraltar, they (the postmasters) have dismissed the vessel they hired at Lisbon for that service, and the other boat which was ordered for Gibraltar (belonging before to the Groin Station) they have stationed between Great Britain and Lisbon. Await their Lordships' directions thereon, as well as respecting the additional expense. Annex an account of the annual charge of the packets. The account referred to, headed:—“The usual charge of the Falmouth Pacquet Boats p[er] annum.” 3 pages. 25. The Rev. Sutton Morgan to the Lords of the Treasury. Sends the report of the “Governors of the Post Office” upon his petition praying them to commiserate his hard and unfortunate case. Has expended about 400l. upon the [Skerrys] Light House for the good of the public, for which he was in continual dread of being arrested and thrown into prison. “The Governors” reported entirely in his favour, only they preferred giving him one entire sum instead of an annuity. This and his arrears might be granted without forming a precedent. Dec. 5, 1727. Accompanied by the report referred to, in which the Postmasters reply to the second allegation in the petition, that it does not appear to them that any packet boat in his Majesty's service has been, or ought to be, charged with payments to the Light Houses anywhere upon the coasts. 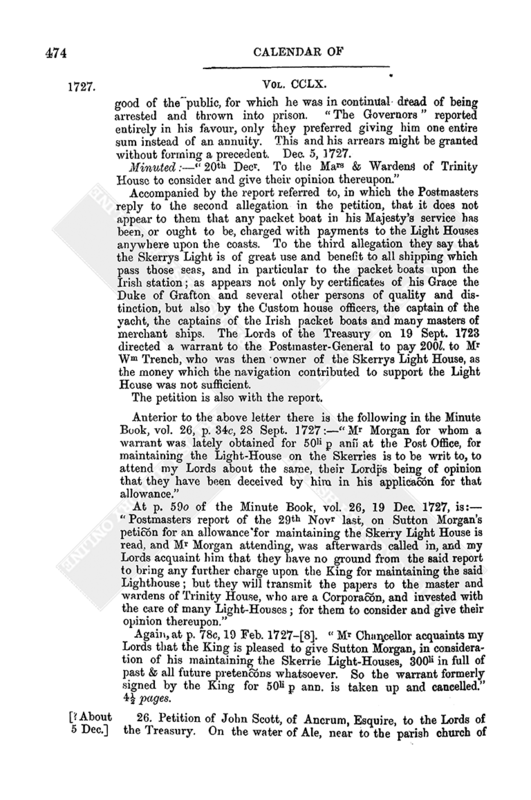 To the third allegation they say that the Skerrys Light is of great use and benefit to all shipping which pass those seas, and in particular to the packet boats upon the Irish station; as appears not only by certificates of his Grace the Duke of Grafton and several other persons of quality and distinction, but also by the Custom house officers, the captain of the yacht, the captains of the Irish packet boats and many masters of merchant ships. 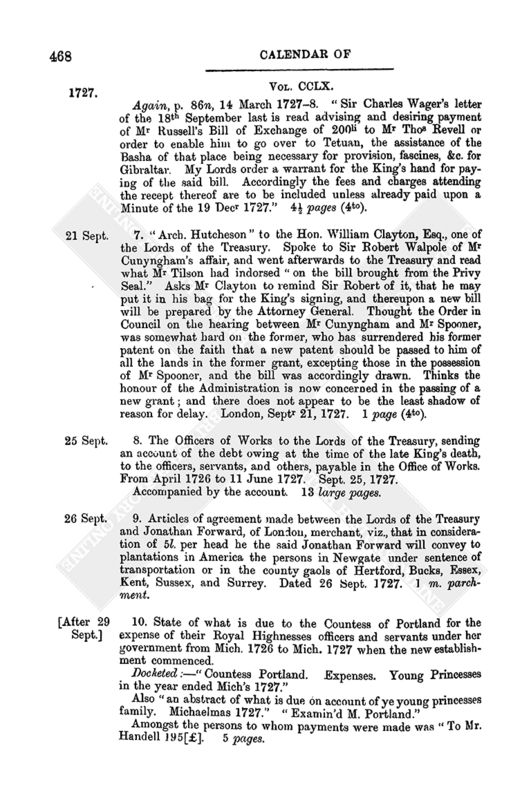 The Lords of the Treasury on 19 Sept. 1723 directed a warrant to the Postmaster-General to pay 200l. to Mr Wm Trench, who was then owner of the Skerrys Light House, as the money which the navigation contributed to support the Light House was not sufficient. The petition is also with the report. Again, at p. 78c, 19 Feb. 1727–. “Mr Chancellor acquaints my Lords that the King is pleased to give Sutton Morgan, in consideration of his maintaining the Skerrie Light-Houses, 300li in full of past & all future pretenc[i]ons whatsoever. So the warrant formerly signed by the King for 50li p[er] ann. is taken up and cancelled.” 4½ pages. 26. Petition of John Scott, of Ancrum, Esquire, to the Lords of the Treasury. On the water of Ale, near to the parish church of Ancrum, in the co. of Roxburgh, there was of old a stone bridge of four arches and three large pillars, built for a passage to all travellers from the eastern or western parts of the county; so that without that bridge, when the waters were out, they would all be stopped in their journeys. The bridge is very decayed by the floods and by the rapidity of the current. The county is not empowered by law to levy the sum requisite for repairs. Proposes, as an expedient, to repair the same, that as he is now the proprietor of the barony of Langnewton, and pays 27l. 15s. 62/3d. yearly to the Crown, he should have a gift of the same, and be burthened with the repair of the bridge. The heritor of the barony of Langnewton used to pay yearly to the minister of Langnewton the sum mentioned, but the fabric of the church is gone to ruin, and the parish is now united to the parish of Ancrum. The Court of Commissioners for plantation of churches appointed the stipend to be paid to the “Diocy of Breichen,” and after the abolition of prelacy it was paid to the Crown. Referred to the Barons of the Exchequer to report thereon, 5 Dec. 1727. [See also the North Britain Book, vol. 9, p. 2.] 1 page. 27. Order of the House of Lords on the petition of Luke Nettervill, Esq., viz. : that the Bishop of Elphin and the Lord Ferrard attend the Lord Lieutenant with the petition and the resolution of the House, and desire his Excellency to lay them before his Majesty. 6 Dec. 1727. The petitioner states that his brother is the Lord Viscount Nettervill and enjoys a considerable estate in [Ireland], and that petitioner is in most miserable condition with a numerous family, and the House of Lords twice recommended him to His Majesty for a pension, to enable him to give suitable education to his children. He is the only one that the peers had applied for to the late King in the two last years of his reign, and has been a protestant for many years, and the only one of his family, and educates his children in that faith; for which reason he is abandoned by all his popish relations, and has nothing under heaven to subsist himself and his children. In the Minute Book, vol. 26, p. 67l, 11 Jan. 1727–8, is:—“3 January 1727. For a penc[i]on of 200li p[er] ann. during pleasure to Luke Netterville on the recommendation of the House of Lords of that Kingdom.” 3 pages. 28. Several papers as to the personal estate and debts of David, Earl of Northeske. A grant to trustees of the personal estate was proposed for the use of the Earl's wife and children. The Earl was sheriff of Forfar and a Crown debtor. Between 1725 and 1727, but the last date is 18 Dec. 1727. 11 pages or parts of pages. 29. Memorial of Sir John Hobart, Bart., “Treasurer of his Mats Chamber, to the Lords of the Treasury.” Transmits account of what is due to his Majesty's servants payable by him, amounting to 9,148l. 0s. 4¾d. Prays an order for payment, and that they may stand on the same footing with those payable by the Cofferer. 19 Dec. 1727. Accompanied by the account of the debt owing at the time of his late Majesty's decease to the officers, servants, and others, which shows the names as well as the salary due to each of them. 26 pages. 30. A similar account of what is due to his Majesty's servants and others, payable in the Treasurer of the Chamber's Office, from 11 June 1727 to Mich. following. 19 Dec. 1727. 13 pages. 31. Memorial of John Baird, Alexander Abercromby, Patrick Campbell, and Robert Johnston, Esquires, late Receivers and Paymasters of the interest due to the creditors of the public in Scotland, to the Lords of the Treasury. As appears by the papers united, they are “really super-expended” the sums set out, amounting to 2,111l., and, in the opinion of the Barons of the Exchequer of Scotland, provision should be made for repayment; pray for relief. The payments were chiefly made to the Equivalent Company. Accompanied by a former representation of the memorialists and a report of the barons. 10½ pages. 32. Robert Byng to the Honble Mr Secretary Scroope. Represents what he presumes is the occasion of the alteration of late years in the Admiralty Droits, so that the money arising from them cannot be depended on, and will be very insufficient to answer any relief to widows of sea officers. Among the rights and perquisites of the Lord High Admiral, those have proved most beneficial which arose from the tenths of prizes taken by H.M. ships of war, and from the tenths of prizes taken by privateers or such as obtained Letters of Marque, as likewise the goods and effects of pirates; besides all wrecks of the sea, flotsoms, &c., the duties relating to anchorages, all royal fishes, all sea-weeds and minerals, the sand and gravel used for the ballasting of ships, &c. The Commanders of H.M. ships of war never had the entire right to prizes till the Act of 1708 allowed the right in the captors, the prizes being constantly accounted for till that time. From whence it appears this part of the Lord High Admirals rights have been given away by Parliament. In 1720 when there were some differences with Spain, the payment of the tenths of prizes due from privateers was exempted and discharged by an Order in Council. The accounting for the goods of pirates has been most shamefully neglected. The Governors of Plantations and Commanders of ships of war have seized the goods and kept them for their own private benefit. When the Captains of H.M. ships of war seize goods of pirates they refuse to account for them at home, or to agents, and the greatest part is not accounted for. Vice-Admirals of maritime counties have also neglected to account for Admiralty droits. Private persons pretending to the rights of Admiralty unjustly seize them, and detain them by force. “Flotsom” and other goods are concealed and used for private advantage. The country people commit most barbarous and inhuman actions towards persons wrecked. Though the Solicitor for the affairs of the Navy is likewise appointed Solicitor of the rights and perquisites of the Admiralty, he thinks himself not empowered to disburse any money imprested to him for any service in discharge of his duty as Solicitor of the Droits of Admiralty. Believes these obstructions not to be so great, but that they may be easily removed. Proposes some remedies. “Treasury Office. For the Navy Decembr 20th 1727.” 8 pages. 33. [Copy of] “Mr Talbot, the Sollicitor General's opinion, relating to the stamps necessary to be put upon all warrants. 30 December 1727.” Signed C. Talbot. Also [copy of] “Sr Edward Northey's opinion relating to the Stamp Dutys. 20th August 1712.” 3 pages. 34. Petition of Thomas Hyde, only son and executor to his mother, Elizabeth Hyde, lately deceased. In the year 1688 petitioner's father, Thomas Hyde, being commander of a vessel belonging to Pool, was in Holland at the time of King William's expedition to England. The Princess of Orange and the States of Holland having several packets of the greatest consequence to be delivered to the Prince, who had then landed in the West of England, the masters of several English ships were strenuously solicited to undertake this service with promises of great rewards, but declined on account of the danger in case of discovery. His mother with a messenger went to the Princess of Orange, then at the Hague, with whom she had audience, and the Princess assured her “that as the case was of a precarious nature she and her family should be the better for it as long as they lived. The affair being agreed to, his mother returned to Rotterdam with the packets, and his father sailed to England and arrived at Pool in Dorsetshire.” On their arrival, his mother, with the letters quilted in her clothes, set out from Pool, “went thro' several of King James's troops, and about thirty miles from Pool met the Prince of Orange and delivered into his own hands the letters.” On the settlement of the Crown an allowance of 50l. per annum was settled on his father and mother and the survivor of them, which they enjoyed all the reigns of the King and Queen and Queen Anne and the late King George. On the death of petitioner's mother, he, in the month of July last, petitioned the Board that the allowance should be continued to him in his own name. Upon enquiry, finds it is continued in his mother's name. Prays it may be continued to him in his own name. Undated. 2 pages. 35. Petition of Samuel Allen of London, gentleman, attorney-at-law, to the Lords of the Treasury, was employed by the Comrs and Trustees of the Estates forfeited in the Rebellion, in the beginning of his late Majesty's reign, acting for England, first as their solicitor, and after the death of the secretary, as secretary and solicitor. 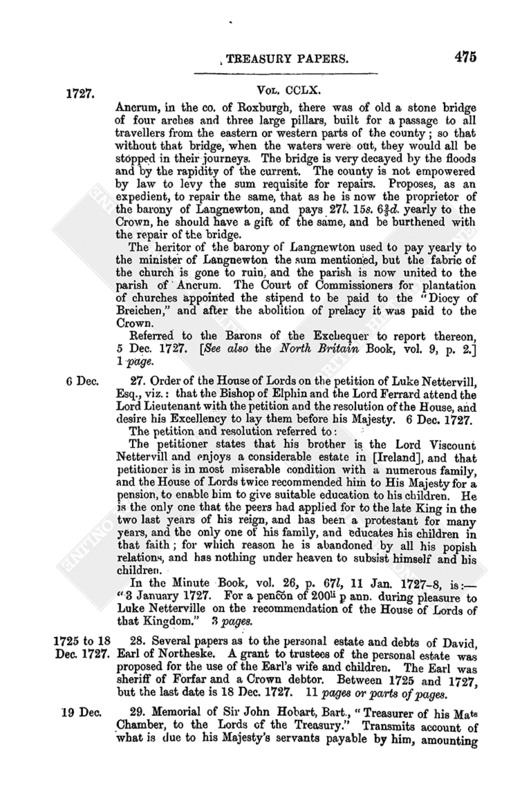 Was summoned by the Committee of the House of Commons (to whom all the books and papers relating to the sale of the estate of the late Earl of Derwentwater were referred) and several times examined, was afterwards summoned by the House and the House of Lords to give evidence on the bill for making void the several contracts for the sale of the late Earl's estate; prays for recompense. 1 page. 36. Memorial of the University of St. Andrews [to the King]. After the union, Queen Anne granted 210l. per annum to each of the four Universities in North Britain, King Geo. I. continued the same upon the establishment of the Civil List. Pray his present Majesty to continue the same. 1727. 1 page. 37. Petition of John Goodwin, master and pilot of H.M yacht Carolina, to the King. Was pilot to the King's father, who took notice of his behavour in a very particular manner and ordered him a pension of 50l. per ann., as appears by the copy of warrant annexed. On applying to the Treasury is told that his name is not upon the books. Gives particulars of his services and says that he had been pilot to most of the British Admirals and prays that directions may be given for the continuance of his pension, and that the arrears may be paid. Also copy of the warrant. Dated 19 May 1727. 2 pages. 38. Petition of Robert Georges, gent., to the Lords of the Treasury. In 1690 was admitted a clerk in the Pay office, when Mr Fox was made paymaster of the forces in Flanders, was “entertain'd” as accountant and soon after as cashier, till Mr Foxes dismission [afterwards] was controller of customs at Bridgewater, until displaced from a misrepresentation, and when the injustice was made known was minuted for the next patent place vacant in the customs, but Her Majesty's death happening, nothing was done therein. Her Majesty made him Yeoman Sadler and Store Keeper on the establishment of her stables, with a house to it, in the “Green Meuse.” This he enjoyed till the new establishment after the Accession of his late Majesty, King George, when his name was left out, and the name of one of the Master of the Horse's domestic servants was placed in his stead. Petitioner had expectation of estates in Gloucestershire and Wiltshire, of at least 500l. per ann., which were enjoyed by his ancestors between five and six hundred years; but was defrauded of them by forgery, perjury, and subornation, after 17 years controvercy in the Courts of Chancery, &c.
Prays to be recommended to the King for comfortable maintenance, &c. 1 page. 39. “Supplemental” petition of the Rev. Mr Sutton Morgan, to the Lords of the Treasury. 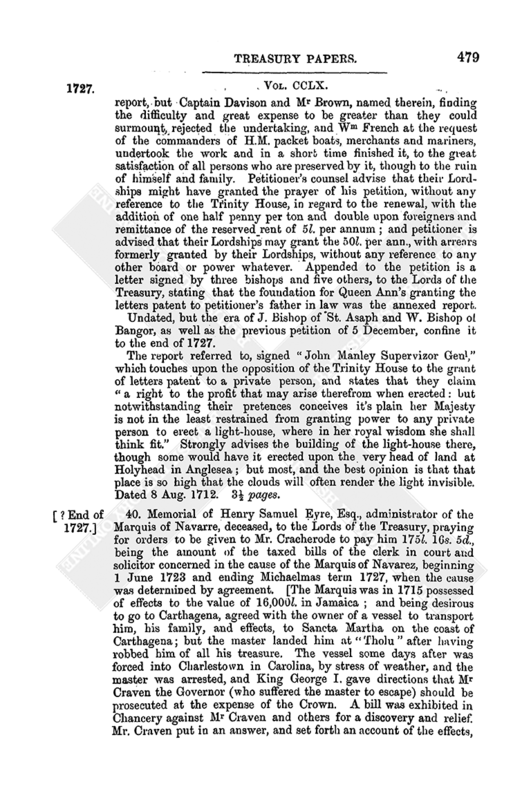 Petitioner lately petitioned and set forth his deplorable case, relating to the Skerries Light House, and prayed assistance of the Crown to support the same. 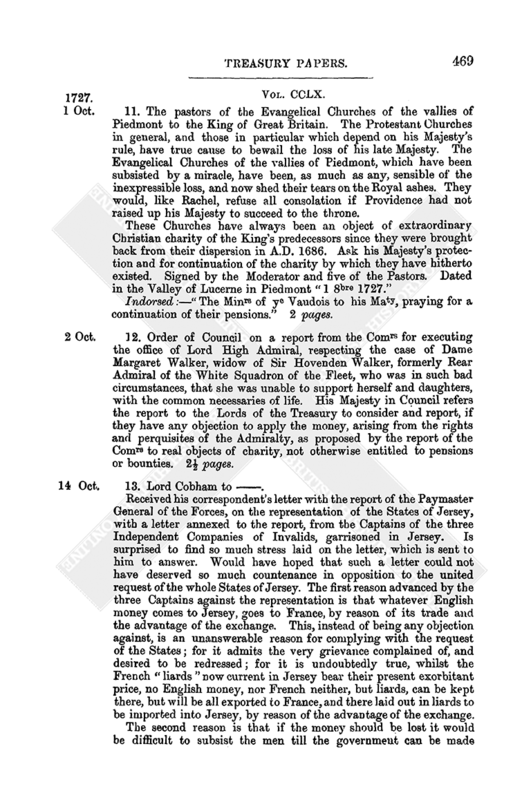 Their Lordships referred the petition to the Trinity House to report thereon. Queen Anne granted letters patent to William French, Esq., deceased, petitioner's father [in law], to build the light house, contrary to the report of the Trinity House; as appears in an annexed report, but Captain Davison and Mr Brown, named therein, finding the difficulty and great expense to be greater than they could surmount, rejected the undertaking, and Wm French at the request of the commanders of H.M. packet boats, merchants and mariners, undertook the work and in a short time finished it, to the great satisfaction of all persons who are preserved by it, though to the ruin of himself and family. 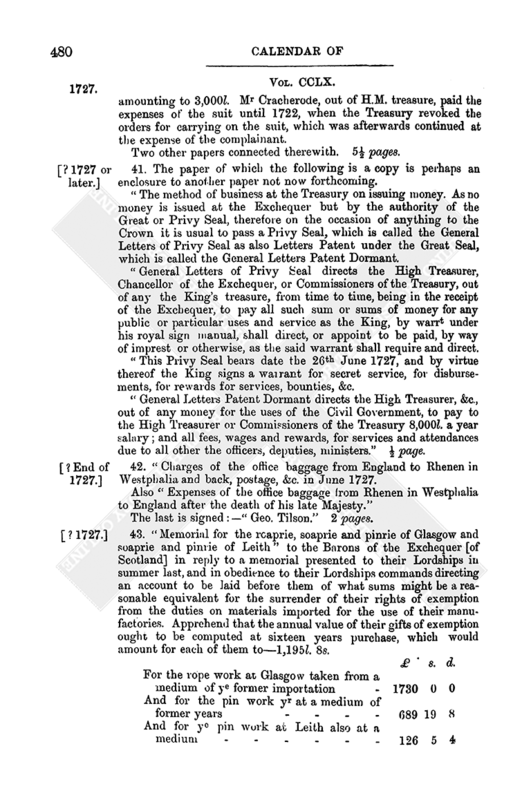 Petitioner's counsel advise that their Lordships might have granted the prayer of his petition, without any reference to the Trinity House, in regard to the renewal, with the addition of one half penny per ton and double upon foreigners and remittance of the reserved rent of 5l. per annum; and petitioner is advised that their Lordships may grant the 50l. per ann., with arrears formerly granted by their Lordships, without any reference to any other board or power whatever. 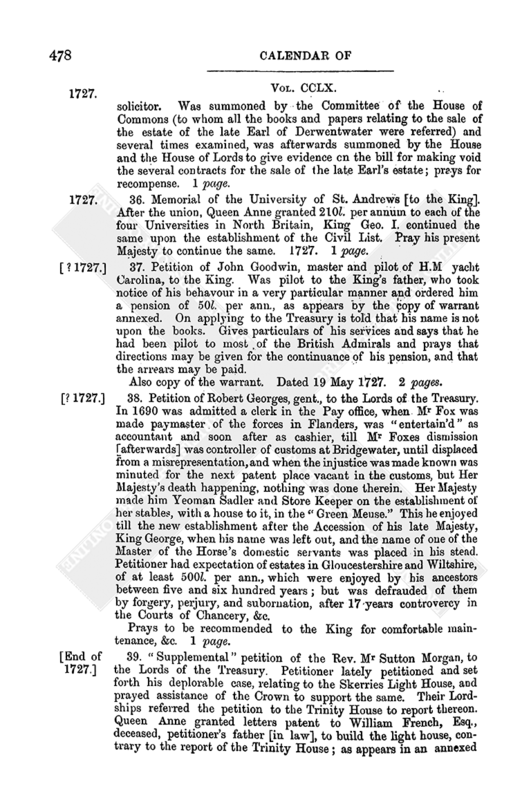 Appended to the petition is a letter signed by three bishops and five others, to the Lords of the Treasury, stating that the foundation for Queen Ann's granting the letters patent to petitioner's father in law was the annexed report. Undated, but the era of J. Bishop of St. Asaph and W. Bishop of Bangor, as well as the previous petition of 5 December, confine it to the end of 1727. The report referred to, signed “John Manley Supervizor Genl,” which touches upon the opposition of the Trinity House to the grant of letters patent to a private person, and states that they claim “a right to the profit that may arise therefrom when erected: but notwithstanding their pretences conceives it's plain her Majesty is not in the least restrained from granting power to any private person to erect a light-house, where in her royal wisdom she shall think fit.” Strongly advises the building of the light-house there, though some would have it erected upon the very head of land at Holyhead in Anglesea; but most, and the best opinion is that that place is so high that the clouds will often render the light invisible. Dated 8 Aug. 1712. 3½ pages. 40. Memorial of Henry Samuel Eyre, Esq., administrator of the Marquis of Navarre, deceased, to the Lords of the Treasury, praying for orders to be given to Mr. Cracherode to pay him 175l. 16s. 5d., being the amount of the taxed bills of the clerk in court and solicitor concerned in the cause of the Marquis of Navarez, beginning 1 June 1723 and ending Michaelmas term 1727, when the cause was determined by agreement. [The Marquis was in 1715 possessed of effects to the value of 16,000l. in Jamaica; and being desirous to go to Carthagena, agreed with the owner of a vessel to transport him, his family, and effects, to Sancta Martha on the coast of Carthagena; but the master landed him at “Tholu” after having robbed him of all his treasure. The vessel some days after was forced into Charlestown in Carolina, by stress of weather, and the master was arrested, and King George I. gave directions that Mr Craven the Governor (who suffered the master to escape) should be prosecuted at the expense of the Crown. A bill was exhibited in Chancery against Mr Craven and others for a discovery and relief. Mr. Craven put in an answer, and set forth an account of the effects, amounting to 3,000l. Mr Cracherode, out of H.M. treasure, paid the expenses of the suit until 1722, when the Treasury revoked the orders for carrying on the suit, which was afterwards continued at the expense of the complainant. Two other papers connected therewith. 5½ pages. 41. The paper of which the following is a copy is perhaps an enclosure to another paper not now forthcoming. “The method of business at the Treasury on issuing money. As no money is issued at the Exchequer but by the authority of the Great or Privy Seal, therefore on the occasion of anything to the Crown it is usual to pass a Privy Seal, which is called the General Letters of Privy Seal as also Letters Patent under the Great Seal, which is called the General Letters Patent Dormant. “General Letters of Privy Seal directs the High Treasurer, Chancellor of the Exchequer, or Commissioners of the Treasury, out of any the King's treasure, from time to time, being in the receipt of the Exchequer, to pay all such sum or sums of money for any public or particular uses and service as the King, by warrt under his royal sign manual, shall direct, or appoint to be paid, by way of imprest or otherwise, as the said warrant shall require and direct. “This Privy Seal bears date the 26th June 1727, and by virtue thereof the King signs a warrant for secret service, for disbursements, for rewards for services, bounties, &c.
“General Letters Patent Dormant directs the High Treasurer, &c., out of any money for the uses of the Civil Government, to pay to the High Treasurer or Commissioners of the Treasury 8,000l. a year salary; and all fees, wages and rewards, for services and attendances due to all other the officers, deputies, ministers.” ½ page. 42. “Charges of the office baggage from England to Rhenen in Westphalia and back, postage, &c. in June 1727. The last is signed:—“Geo. Tilson.” 2 pages. 43. “Memorial for the roaprie, soaprie and pinrie of Glasgow and soaprie and pinrie of Leith” to the Barons of the Exchequer [of Scotland] in reply to a memorial presented to their Lordships in summer last, and in obedience to their Lordships commands directing an account to be laid before them of what sums might be a reasonable equivalent for the surrender of their rights of exemption from the duties on materials imported for the use of their manufactories. Apprehend that the annual value of their gifts of exemption ought to be computed at sixteen years purchase, which would amount for each of them to—1.195l. 8s. The duties on goods imported for manufactures as taken from the Custom House books will differ very much from their account which is defective by being destroyed or carried off in the Rebellion. Also a copy of the above, in the margin of which is “Anno 1727.” 4¾ pages. 45. Petition of Robert, Earl of Morton, to the King, by the infeofments of his estate in Orkney and Zetland is subject to pay a feu duty to the Crown of 100l. per ann. In consideration of the singular services of petitioner's ancestors, the duty has never been exacted. For the forwardness of the late Earl and of the petitioner in supporting the Crown, his late Majesty granted the duty by a Commission of Chamberlanrie to John Ewing, Esq., for the behoof of petitioner for 21 years if the King so long lived. This has become void by the demise of the King. Prays relief. Undated, but in the North Britain Book, vol. 8, p. 321, a petition from him of an earlier date was referred to the Barons of Scotland for report on 20 May 1727. 1 page. 46. A similar petition of the same Earl to the King. 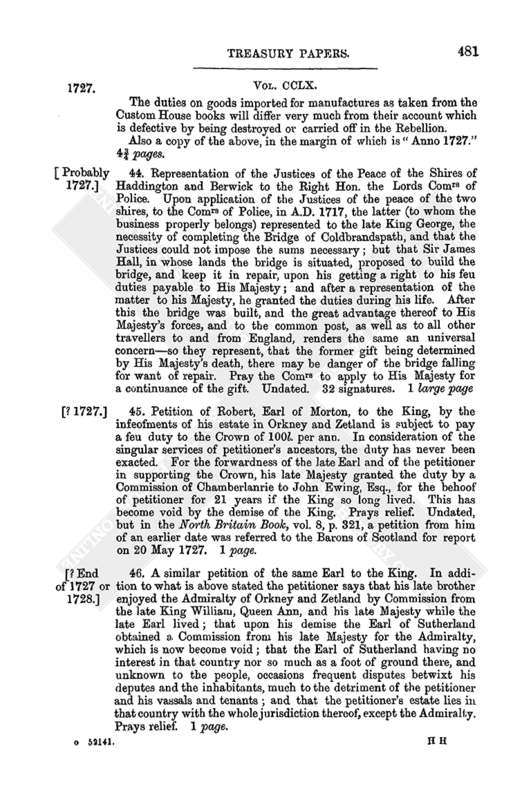 In addition to what is above stated the petitioner says that his late brother enjoyed the Admiralty of Orkney and Zetland by Commission from the late King William, Queen Ann, and his late Majesty while the late Earl lived; that upon his demise the Earl of Sutherland obtained a Commission from his late Majesty for the Admiralty, which is now become void; that the Earl of Sutherland having no interest in that country nor so much as a foot of ground there, and unknown to the people, occasions frequent disputes betwixt his deputes and the inhabitants, much to the detriment of the petitioner and his vassals and tenants; and that the petitioner's estate lies in that country with the whole jurisdiction thereof, except the Admiralty. Prays relief. 1 page. 47. Petition of Lieut. Col. John Irwin to the Lords of the Treasury. Was sent to Ireland to be placed on the establishment of half pay as Lieutenant Col. of Foot, and did duty during the Rebellion. Was left out of the establishment in 1720 until replaced, but without retrospect pay. Prays to be allowed the arrears out of a debt due to the Crown from the Collector of Sligo. Copies of four other documents connected with Irwin's case. 4 pages. 48. Memorial of Patrick McDowall, of Edinburgh, gentleman. Has a claim on the Government for 910l. in right of his father-in-law since the year 1696. The late King George referred his case to Sir Robert Wallpole, who told him that he could not expect England would pay the Scot's debt; and that until he could find out a fund in Scotland undisposed of he could not expect payment. The returned duties or fines payable by the vassals of the Crown in Scotland, upon their being admitted tenants, are not disposed of, and there is no regular account of them brought into the Exchequer. The tenants ordinarily give bonds to the sheriffs of the counties, where the estates lie, to be accountable for these fines when called for, and being small sums and attended with difficulty to bring them in, they are little inquired after, and when Parliament men happen to be admitted tenants they procure gifts from the Treasury of the duties or fines payable by them. The “feu duties” out of the estate of the late Earl of Seaforth, in the north of Scotland, have not been paid since the Rebellion, in regard the lands are not yet sold and the rents cannot be levied but by military force. Prays a warrant to the Barons of the Exchequer in Scotland to grant him a commission for collecting such feu duties as have or shall become due to the Crown and to discover concealed tenants who lie out unentered, and have not attorned to the Crown, &c. 1 page. 49. 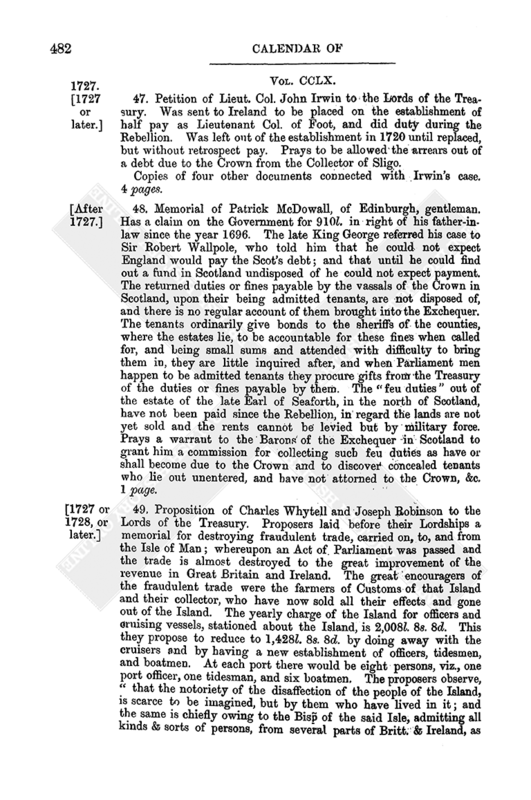 Proposition of Charles Whytell and Joseph Robinson to the Lords of the Treasury. Proposers laid before their Lordships a memorial for destroying fraudulent trade, carried on, to, and from the Isle of Man; whereupon an Act of Parliament was passed and the trade is almost destroyed to the great improvement of the revenue in Great Britain and Ireland. The great encouragers of the fraudulent trade were the farmers of Customs of that Island and their collector, who have now sold all their effects and gone out of the Island. The yearly charge of the Island for officers and cruising vessels, stationed about the Island, is 2,008l. 8s. 8d. This they propose to reduce to 1,428l. 8s. 8d. by doing away with the cruisers and by having a new establishment of officers, tidesmen, and boatmen. At each port there would be eight persons, viz., one port officer, one tidesman, and six boatmen. The proposers observe, “that the notoriety of the disaffection of the people of the Island, is scarce to be imagined, but by them who have lived in it; and the same is chiefly owing to the Bis[ho]p of the said Isle, admitting all kinds & sorts of persons, from several parts of Britt. & Ireland, as well as the natives of the said Isle into orders, without their taking the abjuration oath, and the Reformation ‘togather’ with its fruits; the rights & doctrines of the Church of England never having been as yet regularly introduced by a proper authority into the said Island, and the Ecclestl polity thereof being grounded upon a popish, & builded up after a non-juring plan, the laiety are, and cannot but be, thereby miserably oppressed & deluded; and the Papists in Ireland being prohibited from purchasing land estates in that kingdom, have in general turned their money into stock in trade, & have at all times goods & merchandizes to the value of many thousand pounds in the said Island, and their ships trading frequently & directly from Ostend, & some constantly from the ports of Spain; as matters stand at present in ye Island, arms, & ammunition may privately be lodged there (& even foreign military officers concealed) without danger of discovery or of any molestation at the re-shipping of them in favour of any attempt which the Pretender may make upon Ireland or Great Britain: & much larger quantities of gunpowder have been imported from time to time into Island than the use thereof could demand, and in the time of the late war with France, lead brought from Scotland & other warlike ammunitions was wont to be exported from the said Island to the French dominions,” &c. 3¼ pages.